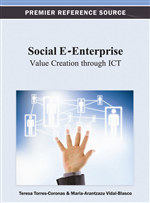 ICT Adoption in the Small and Medium-Size Social Enterprises in Spain: Opportunity or Priority? The chapter analyzes the actual use of Information and Communication Technologies in the social economy in Spain, focusing on the ICT-related management of its organizations. Although ICT adoption is increasingly present in all areas of the so called Information Society, the perception of how and why the effective adoption of ICT takes place is relevant to the performance both of the social economy as whole and to their organizations. This study shows that the analyzed sample of social economFy enterprises has, on the overall, a good ICT positioning in the Spanish business framework. ICT adoption has been a priority of many social economy enterprises, allowing them to reach a fair level of ICT infrastructures and Internet presence. Furthermore, ICT adoption is seen as an opportunity to enhance their competitive advantage in the markets, mainly through electronic commerce. For a sector, it is also an opportunity to improve internal management, taking advantage of the integration of electronic procedures. The concept of social economy is a relatively recent one for the Spanish society.The creation of the National Institute for the Promotion of Social Economics (INFES) in 1990 represents the first recognition of the social economy in the country. Spanish rulers subsequent have unfold legislation according to the increasing importance of the social Economy. A first change in 2001 led to the creation of the Council for the Promotion of Social Economy, taking not only an advisory role but also having a consultive character. The adoption of the Law on Social Economy in 2011 has further advanced on the definition and delimitation of the organizations that should be considered within the social economy. According to the Spanish Law on Social Economy (BOE, 2011), “the social economy is the set of economic and business activities performed by private sector organizations pursuing either the collective interest of its members or the general economic or social interest, or both”. It further defines social economy groups as organizations acting according to the following principles: (1) primacy of people and social purposes on capital, with autonomy, transparent management, and democratic member control, (2) distribution of the benefits of economic activity primarily according to labor input and activity conducted by the partners, (3) promotion of internal solidarity and concern for community local development, and (4) independence from the government. Furthermore, the Law also specifies the organizations of the social economy: cooperatives, mutual societies, foundations and associations, worker-owned firms, social reintegration firms, as well as other organizations governed according the above defined principles. The legal Spanish definition of social economy is useful at least in the sense that it provides a background for a statistical description and further measures of the role of the social economy within the Spanish economy. It also includes the main lines of thought in the scientific conception of the social economy in the country (Barea, 1990, 1991; Barea & Monzón, 1999; Barea & Pulido, 2001). The Spanish social economy sector is nowadays consolidated. Following the Spanish Confederación Española de la Economía Social (Social Economy Spanish Confederation, CEPES) it aggregates more than 45,000 organizations and provides 3% of GDP (ESMED, 2011; CEPES, 2011). It must be pointed out that the Confederation groups mainly cooperatives and worker-owned firms, constituting over the 83% of its members. Cooperatives are the most common form of social organization in Spain, accounting for a bit more than 60%, whereas worker-owned firms constitute the remaining 40%. Around 2,350,000 individuals are linked to the social organizations in CEPES, although only the 33.4% are partners and direct employees of the organizations. Farmers and stock breeders associated to agricultural cooperatives account for the 48.8%, whereas the remaining are self-employed linked to social organizations. Finally, it must be pointed out that, following Monzón (2010), at least 4,200 private foundations and around 150,000 active associations must also be considered within the Spanish social economy. Their total contribution to the Spanish economy is nevertheless much more difficult to actually appraise. Foundations employ an estimated total of 47,000 individuals whereas associations contribute with a total of 470,000 (Monzón, 2010). The significant growth of the social economy in Spain goes hand by hand with a similar growth in Europe, where social economy enterprises represent 2 million enterprises (i.e. 10% of all European businesses) and employ over 11 million paid employees (the equivalent of 6% of the working population of the EU). Out of these, 70% are employed in non-profit associations, 26% in cooperatives and 3% in mutual societies (European Commission, 2012). Social economy organizations and social enterprises have an important role as suppliers, especially in those markets that are not adequately served either by private or by public entities, as well as in achieving social and public goals. Furthermore, social enterprises help combating social exclusion and can foster local development, as they are often locally based organizations and linked with local authorities (Heckl & Pecher, 2007).